If you’ve always dreamed of being a chocolate maker, you’re in for a sweet surprise. Not only is the field of chocolate making a thriving industry, but it’s also one of the most unique fields you can go into and offers a significant amount of flexibility and growth. Chocolatiers are culinary professionals that create candies and confections using chocolate. Chocolatiers usually do not make the chocolate themselves, but instead use existing chocolate to create their confections. They may also work in chocolate decorating, molding, dipping and tempering. Chocolatiers may have a wide variety of backgrounds but usually undergo some level of professional culinary training. Chocolatiers will sometimes work for chocolate shops, restaurants or other related establishments. Chocolatiers need to be extraordinarily precise and consistent about their creations. Ganache, fondant and other chocolate confections can sometimes be complex to make. Chocolatiers will also sometimes be trained in marketing and other areas of business management, as many chocolatiers have the goal of owning their own shop. What Does a Chocolatier Do? A chocolatier will usually work for a specific establishment making and creating chocolate confections. Chocolatiers will also sometimes enter competitions to showcase their chocolate skills and to market their businesses. Sometimes a chocolatier will run their own business of chocolate creations. Chocolatiers usually do not make the chocolate themselves, but instead use existing chocolate to create their confections. Chocolatiers will sometimes perform seasonal work, as there are certain times of the year that are busier than others. The Chicago Tribune states that those interested in a career as a chocolatier can also sometimes apprentice or intern under a chocolatier to learn more about the industry and more about running a chocolate company. Many hotels and other restaurants will hire a chocolatier for their desserts. Chocolatiers may specialize in specific areas such as the molding, sculpting or tempering of chocolates. They may also make other types of confection such as sugar-based confections. Chocolatiers operate much like a trade with different skill levels. Only the best chocolatiers will eventually become considered a Master Chocolatier. Master Chocolatiers are often in charge of other confectionery makers and often open their own shops. How Do You Become a Chocolatier? 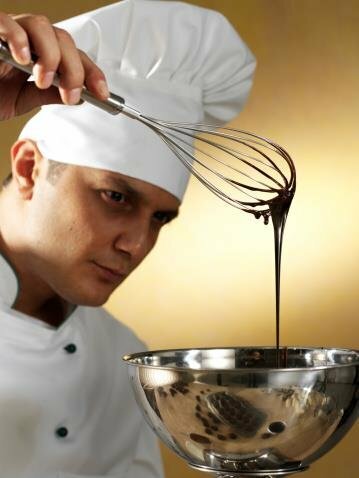 Most chocolatiers will begin their profession as a pastry chef or a confectionery chef. These chefs are highly skilled individuals that usually go to a culinary arts school. There are culinary art schools available nationally and even online. Chocolatiers are specialized culinary arts students that need many years of experience, as chocolate can be extraordinarily difficult to work with. Many culinary arts schools offer advanced degrees for those that want to pursue work as a chocolatier. A chocolatier needs to master many techniques. Chocolate flavoring, texture and design demands precision. Once these techniques are mastered a chocolatier will usually be hired by a chocolate company or may open up their own line of chocolates. Many chocolatiers will also work for companies that manufacture chocolate. They may find ways of creating chocolate through automated processes and may work as developers for a line of chocolates for a larger company. How Do You Advance as a Chocolatier? A chocolatier will usually advance based on reputation. Chocolatiers can eventually open their own chocolate shop or can focus on creating a comprehensive line of chocolate products. Many chocolatiers become extremely famous in their own right, as noted in the National Geographic article about the ten behest chocolatiers in the world. Chocolate is an exceptionally unique industry that operates unlike many other industries in the world, and most people who venture into this industry will need to be uniquely devoted to the art of chocolate. Chocolatiers will find that the job is extremely stable and that the pay rises based not only on experience but also based on talent and skill. Many chocolate companies now operate entirely online as a means to reduce their overhead and get the best possible exposure for their products.